This research aims to analyze the sovereignty of the state related to the succession or separation of East Timor from the territory of the Republic of Indonesia. In addition, this research also analyzes the implementation of the pacta tertiis nec nocent nec prosunt principle related to the Timor Gap Treaty between Indonesia and Australia. This research is used normative law research by collecting secondary data. Data is collected using methods of literary study by collecting legal material and information in the form of legal materials of primary, secondary, and tertiary. In order to get a clear explanation, the data will be arranged systematically and analyzed using descriptive methods. The results of this research show that Timor Leste has the sovereignty and legal capacity to provide protection to its citizens, territories and activities. But the power of the state is limited to the territory, the emergence of the power of another country, and lies in international law. In relation to the succession of the state, since the United Nations Transition Administration in East Timor on behalf of the United Nations handed over the sovereignty of East Timor on 26 May 2002 to the people of Timor Leste, it indicates the succession of the state. Whereas in relation to the pacta tertiis nec nocent nec prosunt principle, Article 34 of the Vienna Convention 1969 on the International Treaty firmly adheres to the the pacta tertiis nec nocent nec prosunt principle which means that the treaty can not grant rights and obligations to third parties. Under the pratice of the nec noc prosunt nactant pacta, the continental shelf area to the south of East Timor which is the object of the Timor Gap Treaty is no longer under Indonesian sovereignty, but is under East Timorese sovereignty as a consequence of East Timor's independence. Penelitian ini bertujuan untuk menganalisis paham kedaulatan negara terkait dengan suksesi atau pemisahan Timor Timur dari wilayah Republik Indonesia. Selain itu, penelitian ini juga menganalisis asas pacta tertiis nec nocent nec prosunt terkait dengan Perjanjian Celah Timor antara Indonesia dan Australia. Penelitian ini menggunakan penelitian hukum normatif dengan mengumpulkan data sekunder. Pengumpulan data dilakukan menggunakan metode studi kepustakaan Hasil penelitian menunjukkan bahwa Timor Leste memiliki kedaulatan dan kemampuan hukum untuk memberikan perlindungan pada warga negaranya, wilayah, dan kegiatannya. Namun kekuasaan negara terbatas pada wilayah, munculnya kekuasaan suatu negara lain, serta terletak pada hukum internasional. Terkait dengan suksesi negara, sejak United Nations Transition Administration in east Timor atas nama PBB menyerahkan kedaulatan Timor Leste pada tanggal 26 Mei 2002 kepada bangsa Timor Leste, hal tersebut menandakan terjadinya suksesi negara. Sedangkan terkait dengan asas pacta tertiis nec nocent nec prosunt, Pasal 34 Konvensi Wina 1969 tentang Perjanjian Internasional dengan tegas menganut asas pacta tertiis nec nocent nec prosunt yang berarti bahwa perjanjian tidak dapat memberikan hak dan kewajiban pada pihak ketiga. Dengan asas pacta tertiis nec nocent nec prosunt, maka wilayah landas kontinen yang berada di sebelah selatan Timor Timur yang merupakan obyek dari Perjanjian Celah Timor tidak lagi berada di bawah kedaulatan Indonesia, tetapi berada di bawah kedaulatan Timor Leste sebagai konsekuensi atas kemerdekaan Timor Timur. Akehurts, Michael, A Modern Introduction to International Law. London: Geoge Allen and Uwin, 1992. Brownlie, Ian, Principle of Public International Law, 5th ed. Oxford: Clarendon Press, 1998. Charpentier, Jean, Institutions Internationales. Paris: Momentos Dalloz, 1997. Fajar, Mukti dan Yulianto Achmad, Dualisme Penelitian Hukum Normatif & Empiris. Yogyakarta: Pustaka Pelajar, 2010. Fenwick, Charkes G., International Law, fourth edition. New York: Appleton Century Crolt, 1965. Harris, David J dan Stephan Livingstone, The Inter-America System of Human Rights. Oxford: Clarendon Press, 1998. Hanitijo, Ronny, Metode Penelitian Hukum, Cetakan ke II. Jakarta: Ghalia Indo, 1991. Kusumaatmadja, Mochtar dan Etty R. Agoes, Pengantar Hukum Internasional. Bandung: Alumni, 2010. Mauna, Boer, Hukum Internasional Pengertian Peranan dan Fungsi dalam era Dinamika Global, Bandung: Alumni, 2005. Mugerwa, Nikambo, Subject of International Law. New York: Mac Millan, 1968. O’Brien, John, International Law. United Kingdom: Cavendish Publishing Limited, 2001. Parthiana, I Wayan, Pengantar Hukum Internasional, Cet II. Bandung: Mandar Maju, 2003. Rudy, T May, Hukum Internasional 1. Bandung: Refika Aditama, 2002. Schwarzenberger, G. A, Manual of International Law. London: Steven an Sons, 1960. Shaw, Malcom N., International Law, 6th ed. Cambridge: Cambridge University Press, 2008. Malcom N. QC, Hukum Internasional, Terjemahan M.N. Shaw, International Law. Bandung: Nusa Media, 2013. Starke, J. G., Pengantar Hukum Internasional, Edisi Kesepuluh 1. Jakarta: Sinar Grafika, 2004.
, J. G., Pengantar Hukum Internasional, Edisi Kesepuluh 2. Jakarta: Sinar Grafika, 2007. Sefriani, Hukum Internasional Suatu Pengantar. Jakarta: Rajagrafindo Persada, 2010. Suryokusumo, Sumaryo, Studi Kasus Hukum Internasional. Jakarta: Tatanusa, 2007. Thontowi, Jawahir dan Pranoto Iskandar, Hukum Internasional Kontemporer. Bandung: Refika Aditama, 2006. United Nations, YearBook of the ILC, “Documents of the second part of the seventeenth session and of the eighteenthsession including the reports of the Commission to the General Assembly”, volume II, A/CN.4/SER.A/1966/Add.1, (1996): 227. Bartelson, Jens, “The Concept Of Sovereignty Revisited”, The European Journal Of International Law Vol. 17 No.2, (2006): 463. Dumberry, Patrick, “State Succession To Bilateral Treaties: A Few Observations On The Incoherent And Unjustifiable Solution Adopted For Secession And Dissolution Of States Under The 1978 Vienna Convention”, Leiden Journal Of International Law, Volume 28, Issue 1, (March 2015): 13. Geraldi, Aldo Rico, “Pertanggungjawaban Pemerintah India Terkait Tindakan Pelanggaran Kekebalan Dan Keistimewaan Yang Dilakukan Terhadap Perwakilan Diplomatik Amerika Serikat Ditinjau Dari Ketentuan Hukum Internasional”, Jurnal Komunikasi Ilmu Hukum, ISSN : 2356-4164, Volume 3, Nomor 1, (Pebruari 2017): 4.
, Aldo Rico, “Penyelesaian Sengketa Kasus Investasi AMCO VS Indonesia Melalui ICSID”, Kertha Semaya, Vol. 02, No. 02, (Februari 2014): 3. Guzman, Andrew T., “The Design Of International Agreements”, The European Journal Of International Law Vol. 16 No.4, (2005): 580. 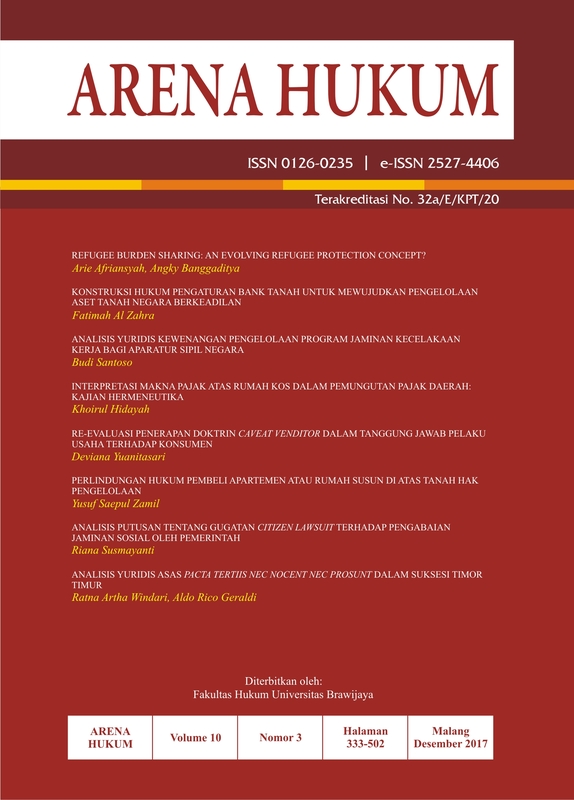 Harry, Purwanto, “Keberadaan Asas Rebus Sic Stantibus Dalam Perjanjian Internasional”, Mimbar Hukum, Jurnal berkala Fakultas Hukum Universitas Gadjah Mada, Edisi Khusus, (November 2011): 118. Koskenniemi, Martti, “What Use For Sovereignty Today?”, Asian Journal Of International Law, 1, (2011): 62. Martini, Mario And Matthias Damm, “Succession Of States In The EU”, Ancilla Iuris, (2014): 164. Yuliantiningsih, Aryuni, “Penerapan Asas Pacta Tertiis Nec Nocent Nec Prosunt Berkaitan Dengan Status Hukum Daerah Dasar Laut Samudra Dalam (Sea Bed)”, Jurnal Dinamika Hukum, Vol. 10 No. 1, (Januari 2010): 30. Department Of Foreign Affairs And Trade Canberra, “Treaty between Australia and the Republic of Indonesia on the Zone of Cooperation in an Area between the Indonesian Province of East Timor and Northern Australia [Timor Gap Treaty]", Australian Treaty Series 1991 No 9, Australian Government Publishing Service Canberra (c) Commonwealth of Australia 1995, URL: http://www.austlii.edu.au/au/other/dfat/treaties/1991/9.html, diakses 6 Juli 2017. Department Of Foreign Affairs And Trade Canberra, "Timor Sea Treaty between the Government of East Timor and the Government of Australia", Australian Treaty Series (2003) ATS 13, URL: http://www.austlii.edu.au/au/other/dfat/treaties/2003/13.html, diakses 6 Juli 2017.